November 19, 2015 Port Chester, NY: Clay Art Center is pleased to announce the selection of 17 artists for its upcoming regional juried exhibition TRISTATE OF MIND, juried by internationally recognized curator and gallerist Leslie Ferrin. The exhibition, opening on January 30th from 6-8pm and running through March 19, 2016, will showcase a breadth of sculptural, installation and functional work and will feature a contemporary cross-section of emerging ceramic artists working within a 75 mile radius of Port Chester, NY. 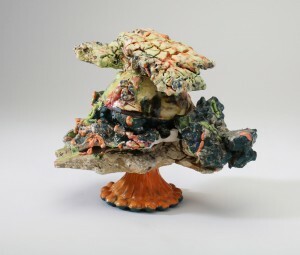 TRISTATE OF MIND kicks off IN OUR BACKYARD, Clay Art Center’s year-long focus on artists who are working in the New York metropolitan area, are using clay as their mode of expression, and are making an impact in the field of contemporary art. IN OUR BACKYARD will feature five exhibitions, lectures, workshops, a symposium and a catalog. Participating Artists include: Jocelyn Armstrong (Westport, CT), Ryan Blackwell (Brooklyn, NY), Joel Brown (Hartsdale, NY), Brooke Evans (Monroe, NY), Elena Perez Guembe (Brooklyn, NY), Roxanne Jackson (Ridgewood, NY), Adam Knoche (New York, NY), Tom Lent (Wappingers Falls, NY), Kaitlyn Meeks (Stamford, CT), Zachary Robinson (New York, NY), Lauren Sandler (Rock Hill, NY), Max Seinfeld (Danbury, CT), Steven Sitrin (Martinsville, NJ), Lauren Eve Skelly (East Meadow, NY), Tamar Sobol (Scarsdale, NY), Helena Starcevic (New York, NY) and Joan Zagrobelny (Newtown, CT). In the jury process, applicants were asked to answer what trends, aesthetics, or discussions they see this region creating. Finalists will have the opportunity to be juried by a renowned sub-committee for the grand prize, a solo exhibition at CAC in the summer of 2016. The winner will be publically announced at the opening reception for TRISTATE OF MIND on January 30th. The sub-committee includes esteemed members of contemporary art and craft in NY: Glenn Adamson, Director of the MAD Museum; Barry Harwood, Curator of Decorative Arts at the Brooklyn Museum; David McFadden, Emeritus Chief Curator at the MAD Museum and Jennifer Scanlan, Independent Curator. Our juror, Leslie Ferrin, is the director of Ferrin Contemporary, which specializes in ceramic art produced circa 1950 to the present, with a growing emphasis international ceramic artists. For over thirty years, Ferrin Contemporary has been the preferred source for artwork by established and emerging artists and designers whose primary medium is clay, for private collectors, institutions and the media. Based in the Berkshires of Massachusetts, Ferrin Contemporary maintains exhibition space at Independent Art Projects on the MASS MoCA campus in North Adams, Mass and a business office, library and art warehouse at Project Art, an artist residence in a renovated, 19th-century mill building in Cummington, Mass. Visit ferrincontemporary.com to lean more. ***Additional high resolution digital images available upon request. This entry was posted in Exhibition and tagged #ceramicarts #clay # clayartcenter #. Bookmark the permalink.